GE Free-Standing Ranges can be installed free from surrounding cabinetry thanks to their side panels offering a finished appearance. Included on this 30-inch Convection Gas Range is the TrueTemp system that manages oven temperatures to ensure accurate, consistent heating and total cooking performance. It also features SmartLogic electronic controls with platinum sensor that constantly monitors the oven's performance to ensure more precise temperature management. Plus, the sealed gas burner controls let you adjust flame height for various cooking needs. And the Steam Clean option allows you to fill the reservoir with water and clean the machine in just 30 minutes, without any harsh chemicals. 30-inch 5.0 cu. ft. Single Oven Gas Range with Self-Cleaning Convection Oven in Stainless Steel GE Free-Standing Ranges can be installed free from surrounding cabinetry thanks to their side panels offering a finished appearance. Included on this 30-inch Convection Gas Range is the TrueTemp system that manages oven temperatures to ensure accurate, consistent heating and total cooking performance. It also features SmartLogic electronic controls with platinum sensor that constantly monitors the oven's performance to ensure more precise temperature management. Plus, the sealed gas burner controls let you adjust flame height for various cooking needs. And the Steam Clean option allows you to fill the reservoir with water and clean the machine in just 30 minutes, without any harsh chemicals. 30-inch 5.0 cu. ft. 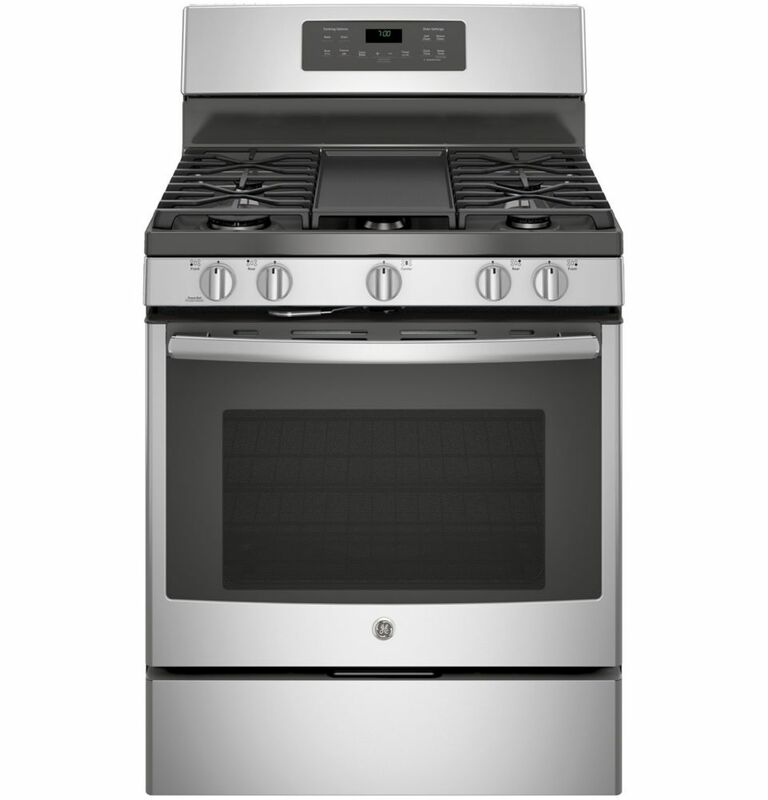 Single Oven Gas Range with Self-Cleaning Convection Oven in Stainless Steel is rated 4.6 out of 5 by 2161. Rated 5 out of 5 by Zingjeweldesigns from Love the top! I consider myself a chef and this cook top is awesom easy to clean has a griddle in the center. The convection oven is top of the line. Looks great. Rated 5 out of 5 by Nerual from Works great! I chose this range after reading lots of reviews including Consumer Reports. We have had the range installed for about 2 weeks and it has been great. It heats far faster than our older electric oven did and baking has been great as well. For those concerned it DOES have an inside light feature. Rated 5 out of 5 by Pburns97 from Love cooking with gas I love the griddle and the different size burners. So far fairly easy to clean. Have not cleaned oven. Burners heat well and evenly but the oven takes a long time to preheat and does not show progress of the preheat. All these things are easy to live with/without for the great stove top cooking. Rated 3 out of 5 by SimplyILona from Overall pretty good. It have lots of functions some I haven’t figured out yet. I am a bit concerned about how it was made. I’m already in the process of my first war ever claim for lose and fallen screws. That concerns me. I do wish it came with 3 racks vs. 2. Other than that no complaints. I love the look, feel & color. I own the mating dish washer & fridge. Rated 5 out of 5 by Wispyd from Easy to Use, Great Result, Love the Grill Easy to Use, Great Result, Love the Grill. I am not using my electric skillet anymore, because the grill is very nice. Rated 4 out of 5 by Marypelliott from Good appliance I like it very much but one thing I don’t like is that if you have the oven on the clock doesn’t show only the oven temperature. Rated 5 out of 5 by Musicman56201 from Exactly what we wanted Looked for this exact need in our stove. Large burners and a griddle with an addition of convection heating. As much cooking as we do it is the perfect stove. yes you can still use the burners, this information can also be found on page 10 of the use/care manual. I have also provided it below. In the event of a power failure, the oven is inoperable and no attempt should be made to operate it. However, the surface burners may be lit with a match. Using extreme caution, hold a lit match near the ports beneath the surface burner cap, then slowly turn the knob to the LITE position. Once lit, surface burners will continue to operate normally. can I turn over the flat centre grill and the other side have ridges &nbsp;on this stove ? Good day, this unit comes with Continuous Grates (2) w/ Centre Griddle. Confused about steam clean. Is this a 'regular' self clean oven with the addition of steam? Fill the resevoir with water and set your oven to &quot;Steam Clean&quot;. After 30 minutes you're able to wipe clean all grime and residue. does it come with the LP conversion kit?